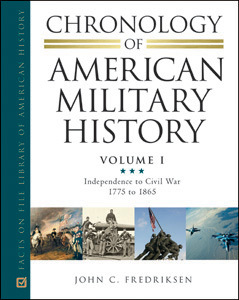 Beginning with the war for America's independence more than 230 years ago up to and including the regional conflicts of the 21st century, Chronology of American Military History is a three-volume panoramic reference covering the entire length of U.S. military history. Nearly 5,000 chronological, day-by-day entries allow students to follow events as they unfold, often in day-by-day detail. Each event is preceded with a standard topical marker to help readers quickly locate the subjects they want to follow. Scattered throughout the text are more than 150 feature boxes highlighting key military figures, and more than 200 black-and-white illustrations, photographs, and maps complement the text. "...excellent...These rich volumes are recommended as a valuable supplement to any American history collection, from public to academic and special collections." "...recommended for public and school libraries." "...sturdily bound and suitable for the reference shelves of all academic and large public libraries, as well as specialized collections...Recommended."